The reform has changed the entire scenario of trade, for manufacturers, exporters and traders and even for all e-commerce businesses putting uniform tax slabs under different HSN Codes for exports, interstate and local supply. Every business fall under the GST except businesses with annual revenue of less than Rs 20 lakh are exempt from registration. So whether it is a manufacturing concern or a trading firm or any other service sectors all falls under the GST under different tax slabs depending upon the nature of product or services offered. And e-commerce is not an exception either. GST is considered to be a significant step in the indirect form of taxation in India because it has amalgamated various central and state tax into a single tax to mitigate the double taxation which existed earlier to GST. Our previous VAT rates system differ from state to state on the other hand with the arrival of GST, the tax system has become uniform across the nation and taxes now divide on the central and state government. 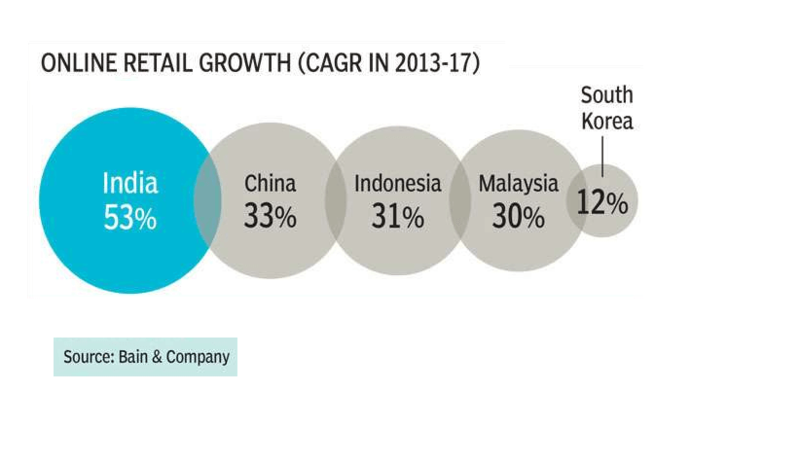 India is one of the fastest growing e-commerce markets, and the country’s online retails market witnessed a compound annual growth rate of 53% for the period 2013 t0 2017 according to the latest report by consultancy firm Bain & Company. There are around 5696 OpenCart store owners in India. So the number of users is exponentially high for India and the transformation is huge. Report from sources says GST collections in April exceeded Rs 1 lakh crore in the Financial Year 2018, and the economy is widely forecast to grow around 7.4% in the current fiscal, up from 6.6% in FY18. To cater to the need of the Goods & Services Tax for the e-commerce industry, specific to OpenCart store owners, you must integrate GST module to your online store to overcome hurdles with the recent changes in the tax structure. The modules you need for your store are easily available on the official OpenCart marketplace along with a number of other modules for OpenCart. 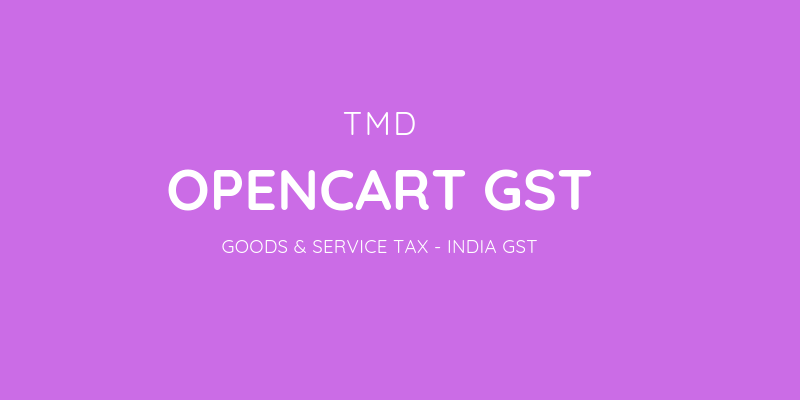 However, you may try TMD OpenCart GST Module & Extension which is also published on the official OpenCart marketplace for India GST OpenCart e-commerce businesses. 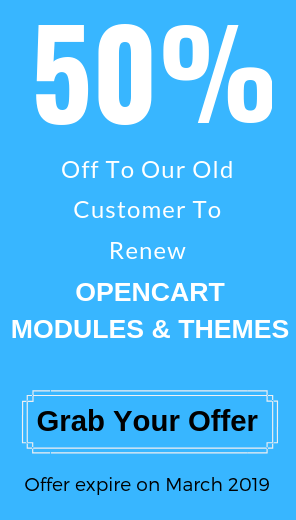 TMD is an official partner of OpenCart so you can find all modules and extensions to be reliable for your OpenCart store. And depending on the nature of your business and how you want to define your tax on your products you can choose specific inclusive or exclusive module for your store. The TMD OpenCart GST Extensions facilitate online businesses who are using the OpenCart framework and it is powered by TMD for India GST e-commerce operators. Are you registered under GST as e-commerce? Did you know GST is mandatory for all e-commerce sellers in India? So if you did not register under GST, first you have to get it to register online. As per GST laws businesses which brings 20 lacs are exempted to pay GST in India and 10 Laks is especially a relief for northeastern states. However, under this scheme, online sellers don’t apply to this threshold. So as an online business it is mandatory for all e-commerce store owners to get register under GST and pay taxes under all sales either local or interstate or export. GST provides the ease of doing online business because being online you play globally. And without GST, government laws do not allow you to make sales out of state. With GST you also need to stay updated with compliances on a monthly or quarterly basis. Why is it good for e-commerce business to register under GST? If you are not registered under GST you lose the flexibility of selling outside of the state. Another way to look at it is, you are losing an opportunity to sell globally. You also cannot claim ITC and as a result, your business will not be able to maximise cash flow or enhance your business. So it is mandatory that all e-commerce business gets register under the GST tax laws and derive maximum benefits that GST has to offer. And if you have been using OpenCart framework for your e-commerce store. You need to think about it. Are you a direct reseller or an e-commerce aggregator. If you fall under direct seller, you can sell them on your OpenCart store with standard GST billing & filing rules. However, if you are an e-commerce aggregator connecting buyers and sellers, GST law requires you to deduct 2% of the sale before you send payments to the seller. And you must pay that amount to the government. Then, your sellers can claim that tax as a deduction on their own GST filings. GST Impact on E-commerce: What you need to update? GST has opened new markets for online e-commerce business, so you are eligible to sell anywhere in India and outside of India without any complexities. This is easier for you if you use the appropriate OpenCart GST module for your store to facilitates the collection of all sales made within a month and provide you with correct and matched reports. And as an E-commerce business, you are required to file a GSTR monthly report for details of Supply made during the month on which tax has been collected. So without updating your website, it would become cumbersome for you to fetch the data from the store. Updating your website with GST module ensures you are meet the expected data on time and file your GST Returns correctly, so all e-commerce store owners have to change their systems due to changes in the tax structure. Also, the place of supply has to be determined and return filing in itself is a huge process. So you must ensure that your current OpenCart store functions under the current GST laws. 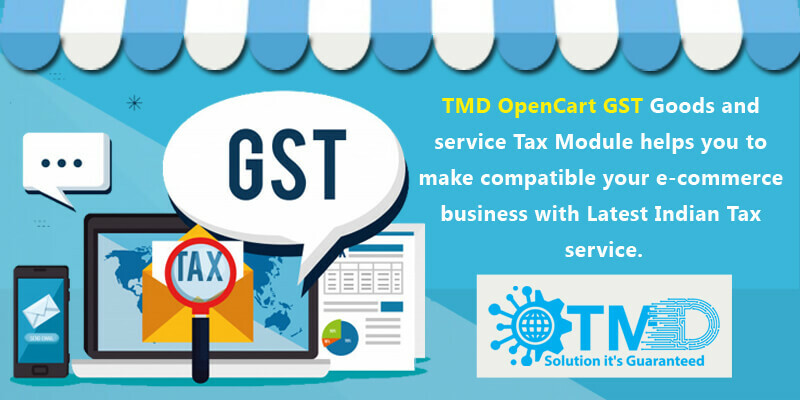 TMD OpenCart GST module is created to provide flexibility for OpenCart store owners to feed order, generate invoice and bill inclusive or exclusive of GST under separate TMD module and generate necessary reports from your online trade. Benefits of TMD OpenCart GST module for your online store. OpenCart marketplace provides an endless number of OpenCart modules and extensions and GST OpenCart is one of the much awaited OpenCart extension with the launch of GST in India. So now you can find TMD OpenCart GST extension on the marketplace for your Store. GST module for OpenCart provides store owners with a user interface to create items with GST define and define their HSN codes at the master level. Orders and invoices are generated for consumers that fetch the GST from the master defined under its own GST tax slabs. OpenCart GST Portal also provides a report related to GST such as HSN wise sales reports as per GST laws. Hence TMD OpenCart GST Extension is created for vendors to accesses order invoicing and reporting as per GST guidelines.